Black leather travel case with razer and badger hair shaving brush. Black leather travel case with Mach 3® razor and travel badger hair shaving brush. Beautiful gift, ideal for the man who travels. Small enough to throw in a wash bag, smart enough to adorn your bathroom. Hand made leather travel case. Luxurious and practical. 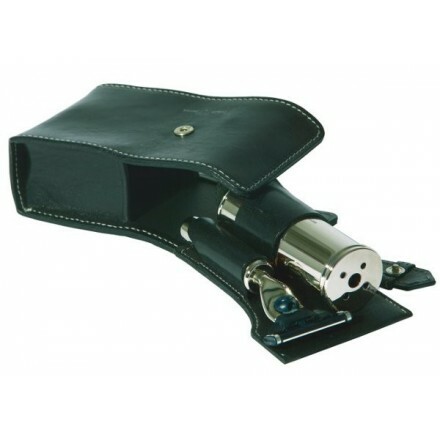 Press stud opening on main case, detachable black leather holder that holds the chrome travel badger shaving hair brush and chrome plated trqavel razer securely within the main outer case. The badger brush is contained within a chrome plated cylinder to protect the bristles whilst travelling. Handsome compact set. Ideal gift, comes boxed.